All the Dals in front of the Christmas tree. Christmas is all fun and games until Mom makes someone wear the silly reindeer antlers! Tess commisserates with Indy over having to wear the antlers. Ha, ha, Tess...now look who has to wear the funny antlers! Later on Christmas Day, we went to my sister's, where Indy tried to convince his Golden Retriever cousin Dancer to play with him. The Dals all had fun playing with the Goldens, and we got to enjoy a great meal and some wonderful company! I would say that Indy enjoyed his first Christmas! Indy "under" the Christmas tree, which had to be placed on a table to avoid puppy curiosity! What's this?? Did somebody say we put COOKIES under the tree for Santa??!!! 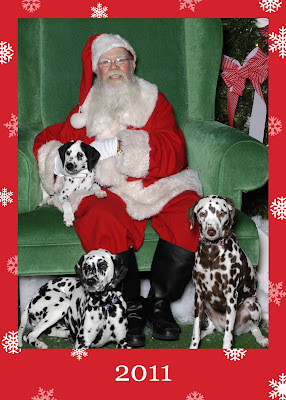 On Christmas morning, it took Tess and Jazz no time at all to teach Indy all about unwrapping Christmas gifts. Of course, once you get them unwrapped, you have to play with all the new toys! This Christmas stuff can really tire a guy out! More pictures later from Indy's first Christmas adventure. Hope you all enjoyed a wonderful holiday! Wishing everyone a very Merry Christmas! Indy is gearing up for his first Christmas tomorrow...presents at home in the morning and then a trip to visit his Golden cousins Dancer and Caleigh for some fun and a yummy Christmas dinner. The little guy has been very good about leaving the presents under the tree. Of course, the tree itself was moved out of his reach this year because we thought that might be a bit too tempting for a puppy ;) Otherwise, I think he will definitely be on Santa's "good dog" list, along with Tess and Jazz. Today we joined five of Indy's siblings for pet therapy in Latrobe. For some of the puppies, this was the first time they had seen their littermates since going home. It was so much fun to see the puppies and how each has fit in with their new families. Here's Indy and Emily. Since Indy was the last to be picked up from the breeder, these two spent a lot of time together and are always happy to see each other. Indy and Emily entertained the residents with one of their wrestling matches and enjoyed the company of their other siblings. Indy did a fabulous job today, both in his interactions with the other puppies and in his interactions with the residents. If today was any indication, I think he will be a kind, compassionate therapy dog, much like Jazz. 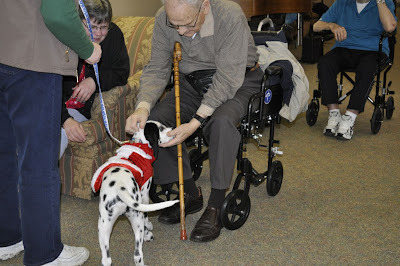 He seemed quite comfortable in these new surroundings and made his rounds and greeted everyone individually. For those of you who followed this litter when they were with Barb, Indy was the puppy known as Dalton. Since the puppies were born on LaDonna's birthday, they were named after her and her family. Here's Indy with his namesake, LaDonna's adorable grandson Dalton. If Indy is anything like Dalton the boy, I'm a very lucky owner! Here's the whole gang who did pet therapy today. 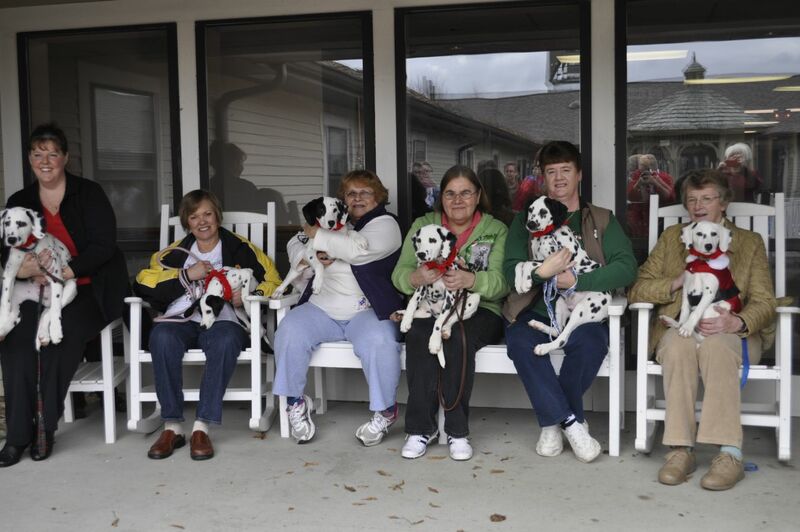 From left to right, it's Deb with Gabe, Millie with Jewel, Mary Ann with Willie, Barb with Emily, me and Indy, and Marian with Andi. We were also joined by several Dal Club friends who helped wrangle puppies and take pictures! Indy and I had a great time today. I always like to visit this facility. The people there are so nice and appreciative of our visits. 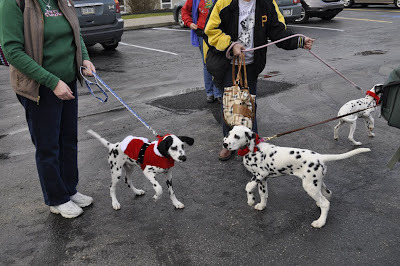 It was a special treat to see Indy's siblings again and watch them bring some holiday cheer to the residents. 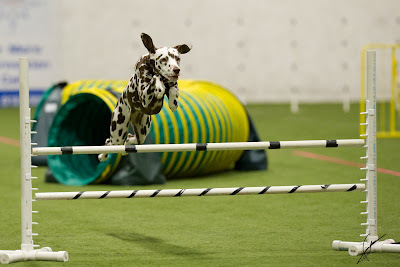 Agility Trial Photos...A Little Late! Two weekends ago, we were at a CPE agility trial at B&D Creekside Activity Center in Latrobe. 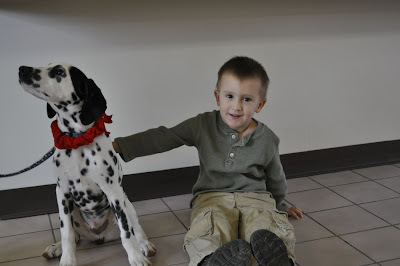 Between the holidays, the puppy, and work, I've been falling behind on blog posts! This is a rather busy photo of all three dogs in the exercise pen at the trial with their heads in a bowl of water. I don't think this bowl was ever meant to accommodate three dogs at once, but it seems they all needed a drink at the same time! Indy and one of his favorite buddies, Toby the Labradoodle. It was chilly that weekend, so Indy was sporting his new blue camo hoodie! Indy's sister Emily came to visit us at the trial again, so he had lots of play time with his sister. This was also Indy's very first hotel stay. As you can see, he thought the accommodations were quite comfortable! He did very well at the hotel and seems to settle in nicely wherever we go. 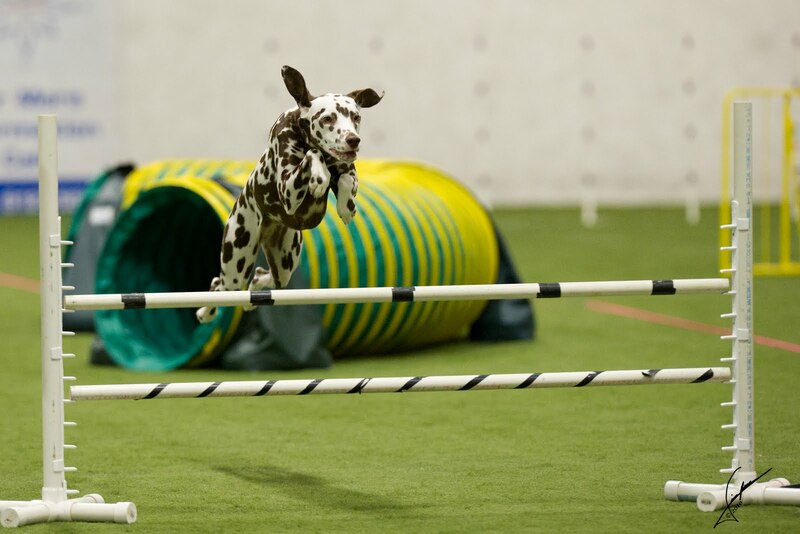 Believe it or not, we actually ran some agility, too! Both girls did really well, qualifying in eight out of nine runs each. Indy got lots of attention from folks at the trial and got to play with many of the dogs. It's a great group of people and dogs and a fantastic socialization opportunity for Indy. For some reason, Tess decided to squeeze herself into Indy's puppy bed inside his playpen. I'm not sure how she squished herself in there, but she was happy to trade beds with Indy. In the meantime, here's Indy smooshed into the corner of Tess' big bed. The girls seem to be attracted to the puppy stuff and Indy tries out the big dog stuff every chance he gets! Nothing like a puppy to inspire blog posts! Indy turned 12 weeks old today, so here are some pictures of his day. What a face, huh? Upon meeting Indy, everyone always comments on how much they love his black ears. As Barb says, she couldn't have done a better job if she had painted them on herself! Indy has mastered the fine art of the play bow. Here he is trying to entice Tess into playing with him. Doesn't take much. Both girls love to romp with Indy. Here's Indy with Jazz's birdie toy. Barb bought Jazz this toy for her first birthday and it's been one of her absolute favorites, and now it's one of Indy's favorites, too. Believe it or not, this little birdie just turned three years old and still chirps!! Jim likes this photo of Indy because it makes his legs look so long and his feet look so big. Actually, he does have pretty big feet. Puppies grow in spurts. Last week, Indy looked real leggy. This week it seems like his body has grown so long. Who knows what's in store for this week coming up! We continue to be amazed at what a good puppy Indy is. We've put away his puppy pen and he's earned a little more freedom in the house. He's learned sit, down, "watch me," spin, twist, and leave it, and we're working on stay. This afternoon the girls were playing what we call the "on-off" game where they use their paw to turn music on and off on a gadget that looks like a Staples easy button. In no time, Indy was using his paw to turn that thing on and off, although he wasn't waiting for us to tell him what to do. He just kept turning it on and off because, well, he could! When Indy was a baby playing with his siblings, Barb and LaDonna noticed that he would take a coveted toy and stash it away for his own personal use. Since he's been with us, I've seen the same thing. Just the other day, Indy waited for Jazz to finish playing with a toy that we often fill with treats. When Jazz finished with it, Indy snatched it up and stuck it in the pile of dog toys in his special hiding place. He's also done this with bones and antlers. He never takes the coveted object away from one of the other dogs. He just waits until they walk away and then he quietly stashes it. Well, this morning, Jim noticed that the TV remote was missing. Although there is an end table right next to the couch where Jim sits, he often leaves the remote on the arm of the couch. Tess and Jazz know that is Dad's prized possession, so they don't touch it. This morning, though, it was nowhere to be found! After searching in the couch cushions, on the floor, and under the couch, I suggested that we look in Indy's favorite hiding place in the pile of dog toys...and there was the remote!! The remote is sticking out of the dog toys a little more than halfway down the photo on the right side. There wasn't a mark on it, so Indy didn't chew on it or play with it. He just knew that this was a coveted item and he stashed it away for himself!! Clever little boy, huh?